This challenge was set by the Kelsall Millennium Committee who gave the Kelsall Guides and Brownies a Millennium Time Capsule to commemorate life in Kelsall in the year 2000. First they put in some guiding memorabilia including handbooks, sashes, badges, promise cards, photos and letters. Then they added lists of village organisations and clubs together with lists of churches, schools and businesses and a map. Then some current magazines, and a Sunday newspaper. Finally they added a seasoning of stamps, some coins, a souvenir mug, a CD, make up and sweets, hoping that they had built up a picture of what it was like to be a Guide or a Brownie at the turn of the century. The full list of items in the Time Capsule can be found here, and a list of organisations in the village at that time here. 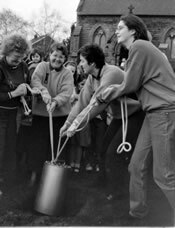 The Time Capsule was buried at a special church service at St Philips, Kelsall on Sunday 20th February 2009, the Sunday closest to Thinking Day when the entire guiding family of over nine million women and girls think of their Guide sisters all around the world. 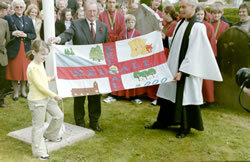 Click here for photos of the filling and burying of the capsule, and the raising of the millenium flag. You may recognise a few familiar faces, including Parish Councillors Ro Cowell and John Gray.